The most common and major ingredient for Kimchi is Chinese cabbage. English Chinese cabbages are less firm, more watery and lighter (around 500-600 g) in comparison to the denser Korean ones, weighing around 3 kg. When soaking Chinese cabbage into salt water, Koreans use coarse salt but here, in Cambridge, I found that this is not necessary for English Chinese cabbage. Since the Chinese cabbage here easily absorbs salt I found that I could just sprinkled cooking salt without using water. Cooking salt contains no additives. And it has a good texture and brighter flavour. Koreans often add fish sauce, fresh fish or oysters to Kimchi depending on the region. This has its pros and cons. For example, Seoul people tend to make Kimchi without any fish or fish sauce so when their Kimchi startd to ferment, the taste is very sour and can only be kept for a short period compared to the kimchi using fish sauce which acts as a preservative. If you do not need to keep your Kimchi for more than 2-3 weeks, I would personally recommend that do not use any fish or fish sauce. 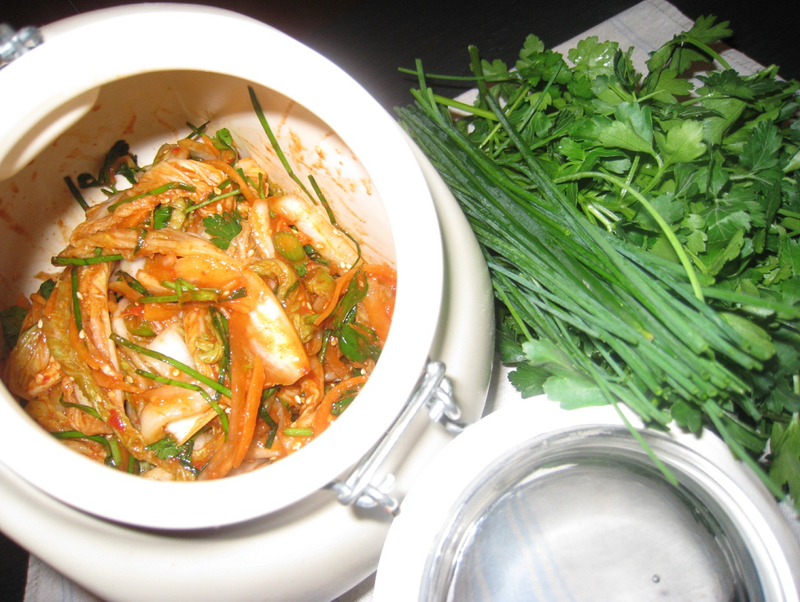 If you are a Vegan then Kimchi will be key ingredient to exploring other Korean dishes. Korean chilli powder is quite different in compared to the red pepper flakes, cayenne pepper or Indian or Thai chilli powder. Korean chilli powder is very red in colour, coarse in size has a somewhat smoky flavour and is quite hot but also sweet. In terms of quality most important is the where the chillies were grown and how they were dried whether in the sunshine or in a commercial process. Many Koreans will not buy chilli powder from the supermarkets because we believe that they are not grown in Korean soil. People tend to buy directly from Korean farmers who grow the chilli peppers themselves and dry them in the sun on breezy day. However this time I used Bart’s local brand of chilli powder. This has a great taste but I added some fresh red chillies like my grandmother used to do and to improve the colourI added tomato puree. My last secret to making the most delicious Kimchi was using some yoghurt. This was part of my grandmother’s recipe which only I knew about in my family. Cut the bottom off the Chinese cabbage and avoid using limp stems or wilted leaves. If there are any tough outer leaves then remove them also. Lay two or three cabbage leaves together down on the chopping board. Slice them lengthwise into 3-4 strips depending on your cabbage’s size. Lay 4-6 layers of cabbage leaves in a large container and sprinkling around 20 -30 g of salt over each layer. Generously sprinkle salt over the thick white part of each leaf rather than the thin to control the final saltiness. In my case each cabbage weighed 560 g so for a total of 1120 g, so I used 120 g of salt. When you finish it leave a heavy bowl on the top of the salted cabbage for about 3 hours. Over this time mix the leaves to rotate the bottommost to the top, you should do this around four times. It is important to not to over-salt the cabbage. Ideally, the leaves should remain slightly crisp. If the process is overdone, the spicy seasoning will not be fully absorbed and the resulting Kimchi will also be too salty.After the three hours has past rinse thoroughly in fresh water 3 to 4 times. Do not squeeze the cabbage just leave in a basket for the water to drain for 10-20 minutes. Check by tasting for saltiness if it is very salty, rinse some more. Now let’s prepare all the ingredients.Put 60 ml of cold water into a small saucepan and add 20 g of sticky rice flour and stir. Put on a high heat and bring to the boil for a minute constantly stirring then take off the heat. Take the chillies, garlic and ginger and grind finely then add this and all the sliced vegetables and the sticky rice flour to a big bowl with Bart’s chilli powder.We also add the sugar and sesame seeds at this stage. Finally before we mix these flavouring you can optionally add tomato puree for colour, yogurt and fish sauce to keep for longer. Wear diposable gloves and mix together with a light touch. Ensure that you have a large container for the final mixing. Put the salted cabbage in first then add the flavouring mix we have just made. Mix cabbage and flavourings together, remember, do not crush or rub hard, just try to lightly mix for two to three minutes until the cabbage throroughly coated. Store your Kimchi in a jar with an air tight lid and and leave in a cool place (less than 10 degreesC) for 2-4 days. Examine the jar and when you see the fermenation process has started then you may serve and thereafter keep your Kimchi in the fridge for around 2-3 weeks. This week I will be using the Kimchi I made last week in three recipes. 40 g roughly sliced spring onions.